About every 3 months, throughout the project, a new Bulletin is published, up-dating the progress being made and the ideas being formed. Links to all of the bulletins are below. To read more information on the build, you can download the bulletins below. RATCLIFFE SPITFIRE PRESENTED WITH NEW TYRES! 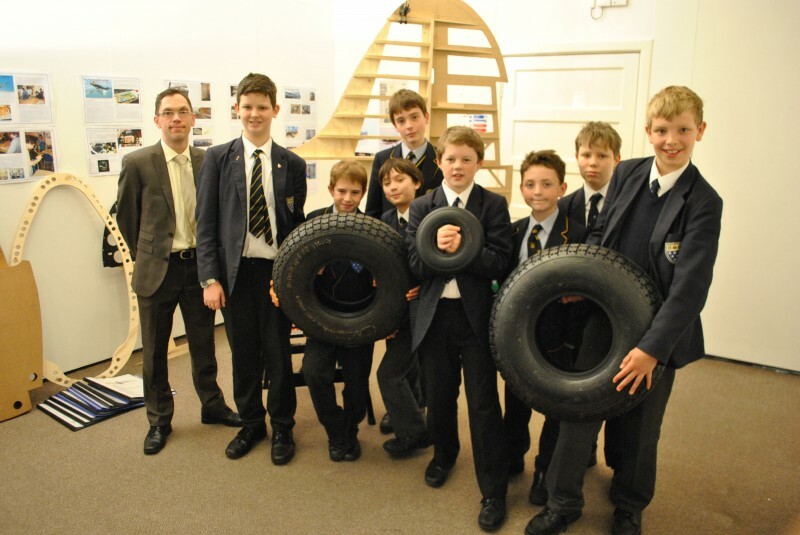 Mr Stuart Hawker, Marketing Manager from Dunlop Aircraft tyres, came to the College on Thursday 28th November 2013 to deliver the three Spitfire tyres Dunlop had agreed to donate to The Ratcliffe Spitfire project. Mr Hawker was able to see the progress of the project and also gave a very interesting talk about modern manufacturing in Britain. His talk was illustrated with a variety of props, including sections from large tyres as well as a raw sheet of rubber which he claimed couldn’t be torn. In fact, he was so confident that he offered a five pound note if anyone could do so. Unfortunately for Mr Hawker, he hadn’t counted on the super-human strength of Dominic Baggott in Year 7, who promptly relieved our guest of a crisp blue/green note from his wallet. To be fair to Mr Hawker, the rubber did have a small tear in it already, which Dom took clean advantage of!